Serena Williams has chased down a man who grabbed her mobile phone while she was in a restaurant. 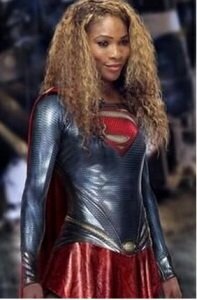 “Soooooo yesterday at dinner the craziest thing happened to me,” Serena Williams posted on her Facebook page, accompanied by a picture of herself as Superwoman. Serena Williams, who is taking the rest of the year off to recover from injuries, claimed the man “grabbed her phone and swiftly left”. Serena Williams said she was “too fast” for the man and was “upon him in a flash”. She added: “In the most menacing, yet calm, no-nonsense voice I could muster, I kindly asked him if he <<accidentally>> took the wrong phone. Serena Williams, who won every Grand Slam singles title except the US Open this year, said she received a “standing ovation” from her fellow diners at the restaurant. Serena Williams described the moment as a “win for the ladies” and said she showed “every man in there I can stand up to bullies”.